We all fell in love with the books and films of Jurassic Park while we were growing up. The films are especially majestic in beauty. And it’s no surprise, as filming for Jurassic Park in Hawaii took place in Kauai. Kauai is a quiet island, away from all the hustle and bustle of the bigger, busier Hawaiian islands. The lush greenery, spectacular waterfalls, and vast canyons make you feel like you’ve stepped back to a time when dinosaurs roamed the earth. And we don’t just think so. All three Jurassic Park, as well as the Jurassic World movies, have filmed in this undeveloped and magical wilderness. So, we think exploring dinosaurs in Kauai is worth talking about. If your child likes dinosaurs and movies as much as mine, you’ve got to add Kauai to your bucket list. The successful movie franchise includes four films with another set to release this summer. The beauty of the island remains untarnished even as a popular film location, but the undeveloped area leaves only about 10% of it accessible by car. Most of the locations that you can reach are in the southern part of the island, so we stayed at the Koloa Landing Resort to be close to all of the good filming locations. You’ll fall in love with the undeveloped wilderness. Kauai is about 300 miles from the big island of Hawaii. It’s just a 5-hour flight from the west coast of the US to the main airport in Lihue near the ocean. The capital city of Lihue only has a few thousand residents, but the island is known for its friendly tourist destinations and unmatched beauty. A dramatic scene in the first film of the series where the helicopter delivers visitors to the Isla Nublar helipad in front of a waterfall is an iconic shot of Kauai’s 400-foot Manawaiopuna Falls in Hanapepe Valley. The popular waterfall has taken on the nickname Jurassic Falls since it was so prominently featured. It is on private land, and you can only view it from the air. Don’t miss the oversized Moreton Bay fig trees in the Allerton Garden, which is part of the National Tropical Botanical Garden. You’ll recognize the giant root system of the tree that served as a nest upon which Grant stumbles, finding hatched velociraptor eggs. Jurassic Park 2 takes place on the fictional island Isla Sorna, known as site B in the sequel. The opening sequence features a family picnic in which Compy dinosaurs swarm little Cathy. Kipu Kai Beach, which is only accessible by boat, was the location for this segment. Olokele Valley provides the beautiful backdrop behind the electric fence constructed to rein in the Tyrannosaurus Rex on Isla Nublar. The lethal current is turned off briefly while Grant and the kids try to navigate through it before Ellie manages to restore it in the original movie. The canyon is privately owned by the Robinson family, who also run a nature preserve in the area. 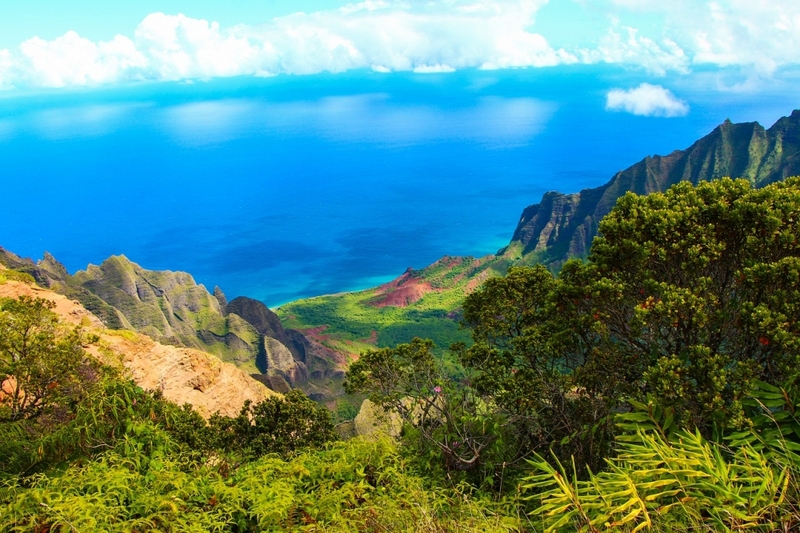 The area is inaccessible except on Safari Helicopters’ 90-minute Kauai Refuge Eco Tour. In the third installment of the franchise, Grant pilots an old InGen barge, guiding survivors to safety. The Wailua River was the set for filming. Some memorable images were shot on the north end of the island. The original film features breathtaking opening shots of the Na Pali Coast standing in for Isla Nublar, which were revisited in subsequent movies in the series. The soaring sea cliffs of Na Pali are best accessed with the help of a tour guide, as they are limited to foot, boat, or air approaches. Jagged peaks and steep valleys make for a strenuous hike. The 11-mile Kalalau Trail requires special permits beyond the first 2 miles, and the rugged landscape is not for the faint of heart. The trail starts at Ke’e Beach, follows a rugged stretch of the coast and deposits you at pristine Kalalau Beach. Many outdoor scenes were filmed at what is now known as Jurassic Kahili Ranch, which has appeared in all three Jurassic Park movies. The privately owned 2500-acre working cattle ranch is on the North Shore. The acreage contains diverse terrain including waterfalls, streams, and lush rainforests leading to more mountainous areas. The most memorable shot was likely the field of grazing dinosaurs in the original movie. The ranch also hosted the film crew for the panoramic view of dinosaur herds viewed from the InGen barge in the third installment. A few miles northeast of Kilauea is secluded Pilaa Beach, where the military came ashore in Jurassic Park III. The riptides and rocky land make it hard to access and it is not an ideal tourist spot, so it might not be high on your list to visit. Take advantage of your kid’s belief in magical things and visit the island of Kauai to see where dinosaurs would live. This summer’s blockbuster movie will only fuel your love of these indescribable creatures. Koloa Resort sits in the heart of the sun-drenched South Shore of Hawaii’s fourth largest island. Visit their Kauai resort to take advantage of the helpful, knowledgeable staff who can help you navigate tours and sightseeing to keep your dinosaur dream alive. It’s no wonder that Hollywood keeps returning to this exotic landscape – you’ll want to visit again too.